Six months after hurricanes ravaged the island, Puerto Rico experienced a tourism boom this Easter. Tourists flocked to the island for Easter, Passover and spring break vacations in record numbers, according to The Puerto Rico Tourism Company, a San Juan promoter for tourism on the island. Many hotels operated at or near 100% occupancy during the holiday weekend that began on March 30. The Tourism Company said the surge is evidence that the tourism is on the rebound. Travel and tourism are hugely important to the bankrupt island and accounted for more than 8% of its GDP in 2017, according to a World Travel and Tourism Council report. 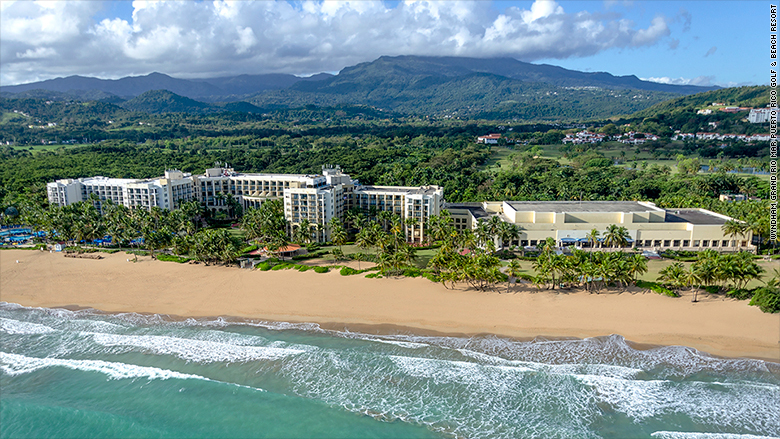 Nils Stolzlechner, general manager of the Wyndham Grand Rio Mar Puerto Rico Golf & Beach Resort near San Juan, said the 400-room hotel was sold out over the Easter weekend -- a record for sales and occupancy. He said that guests spent twice as much at the restaurants and the casinos compared to any other Easter weekend over the last five years. He said that many of the guests booked last minute and were skeptical as to whether the hotel would be ready for them until they got there. "They were really surprised that the hotel was in the best shape it's ever been," said Stolzlechner. "When you come to our resort, you could never tell that the hurricane had hit." Right now there are 15 casinos, 4,000 restaurants, and more than 120 hotels open for business on the island, including Rincon on the Seas, a resort on the west coast of the island. "The whole month of March has been quite good, better than last year," said Arnold Ruiz, general manager for Rincon on the Seas. Ruiz said that his hotel lost power for over a month after Hurricane Maria hit last year, and the beaches were eroded "pretty bad" and "lost quite a bit of sand." "The first couple months there was a lot of bad news; the image was that the whole island was devastated and nothing was happening here," he said. But Rincon on the Seas has been up and running since November and the beaches are starting to recover as the sand naturally returns to the shore, he said. Hurricane Maria reached Category 4 levels when it slammed into Puerto Rico on Sept. 20, 2017, wiping out power for nearly all the island's three million residents and causing billions of dollars in damage. It was a one-two punch, because Puerto Ricans were still trying to dig out from Hurricane Irma, which pummeled the island just two weeks before. For months, the media was dominated by images and stories of the blighted island and its hard-hit residents, who languished without power, food and medical supplies. A Vietnam veteran told CNN that surviving the storm was worse than going through combat. One of the biggest challenges for the tourism industry right now is convincing tourists on the mainland US that it's alright to come back to Puerto Rico, the Tourism Company said. Though some parts of the US territory are still badly damaged, San Juan and other parts of the island have a functional infrastructure. In San Juan many hotels are at full capacity, bolstered not only by tourists, but by contractors who are rebuilding the island. "I'm trying to convince people that it's totally fine," said Tammy O'Hara, a travel agent with Million Miles to Roam, a New York agency. "I think there's still some skittishness going on. I have a relatively large group that's trying to go and they're still on the fence." O'Hara said she's planning to make a trip to the island herself to take pictures of functioning hotels and sandy beaches to show them to her clients.